Nail Art Youtube Channels List. The Best Nail Art Youtube Channels from thousands of top Nail Art Youtube Channels in our index using search and social metrics. Data will be refreshed once a week. About Youtuber Holo everyone, it's me Cristine. I'm not like other nail art channels. Nail polish, drawings of my cat Menchie, locks of your hair, anything goes. Watch my vids, Listen to some jokes,have fun before you die, and hey, may be learn a thing or two about nails. About Youtuber The original nail art channel! Sandi Crystal Ball keeps her fans on top of the hottest nail art designs, DIY nail techniques, and latest nail polish styles that are currently trending. She has been teaching them easy ways to pull-off impressive nail art looks since the beginning of 2010. About Youtuber I'm Robin Moses and I teach hand painted nail art! I make NEW nail tutorials Every Monday, Wednesday and Friday. My channel is about nail art done with cheap materials in a real nail shop setting. My Nail designs are for beginners and advanced nail techs and artists or career professionals who want to take their education in nailart and skills in hand painting all nail designs to the next level. About Youtuber Naio Nails are proud to present our inspirational and informative videos covering everything from preparation, nail tip application, sculptured nails, 3D Nail Art, Acrylic Nails and Gel Nails, creative nail designs, plus insider tips, tricks and how-to's. About Youtuber Welcome to my channel! A No.1 Channel for toe nail art designs! My name is Mila. A Self-taught nail artist and a mum of two. Mydesigns4You are exactly that, my nail art designs created for you. Designs that are simple yet eye catching. About Youtuber The original nail art video channel. Nail art videos everyday and week. Nail Art is anything that we create. About Youtuber An everything channel. You will find amazing nail art videos, designs, ideas and tutorials in this channel. About Youtuber This is a channel where I share my passion for nail art, I upload nail art tutorials compilations regularly. A nail art channel with the latest trends. About Youtuber DIY nail art tutorials including water marbling, drag marbling, drip marbling, gradients, freehand art, nail art decals/stickers and any and everything else I do on my nails! Also tips, tricks, how-to's, FAQs and at home nail hacks. About Youtuber Nail Art Design Tutorials for any occasion. From time to time I also upload other random interests I have. About Youtuber Hi! I'm Hannah Lee and I'm a nail stylist and blogger ~ I love creating and sharing designs with the world! About Youtuber My intention when doing this video is not to steal nobody's work but share and compile the best ones. About Youtuber Get Tips & Tricks for Acrylic Nail Art & Design, Swarovski, Charms, & Acrylic Paint, Bling & Super Detail, or Simple & Sweet. About Youtuber Hi! My name is Megan and I do fun and unique nail designs. Here on my channel you will find nail art using stamping, water decals, and freehand designs. About Youtuber Welcome to the home for easy to follow nail art tutorials, beauty tutorials and reviews. As a Grand Master nail technician, beauty therapist and former educator, I aim to make my videos suitable for all age ranges and skill levels. About Youtuber If u like acrylic nails that are bit "different" u should find everythin u want on this channel! I am not a nail tech and I have had no training what so ever. My channel is here to show that if you have had no training, you can create beautiful nails with just one main ingredient... Practise practise practise!!! About Youtuber Camila Rojas, a Nail designer posts interesting videos on nail art and inspires many people out there. About Youtuber My name is Martina and I'm a 30-year-old nail art fanatic from Sweden. I upload 2 new videos every week on nail art designs and tutorials. About Youtuber My name is Luciana McGee I am a licensed professional nail tech in salt lake city Utah and las vegas Nevada I also took extra courses in all sorts of nail art gel nails everything in this industry my goal is to help others that also enjoy nails. About Youtuber Hi, My name is Mattania Morris and I’m the girl behind the nails. About Youtuber Our channel is all about education, but also, you can get your dose of Young Nails through our Biz Vlog which contains nail demos, inspiration, and a day in the life of Young Nails, where we have a ton of fun. About Youtuber I do GEL & ACRYLIC nails. Gel nails are my FAVORITE. I want to share how I do nails with you, show you things to use for nails and review nail items. Everyone's taste in nail art is DIFFERENT . I have RESPECT for ALL Nail. About Youtuber My name is Jessica Angelique Winsenne, I love everything beauty and art! On this channel you will see a lot of gelnails and other beauty videos. About Youtuber Hi!! My name is Jema and I'm an Australian girl who loves to paint her nails. I create nail art videos that will teach you how to create cute and easy nail art designs. I am a Nail painter, polish addict and I watch way too much TV. Usually while painting my nails. About Youtuber Do you want to learn How to Paint Rose on nails or How to Apply acrylic 3D designs or how to Do Your Own nails At Home?! Watch nail art Hacks on my channel! DIY Perfect nails with Great nail art design EVER! Do it like a Pro! Quick & Easy! Perfectly! There are The Ultimate Guides on my channel of nail art design! Beginners Guides, Step By Step Tutorials! You will learn HOW TO BASICS apply designs. About Youtuber I am a fully qualified nail technician, showing you all my love for nails..... I offer fully sculptured acrylic nails, and will always try something new. About Youtuber POLISH POLISH POLISH. A channel for nail polish favorites, hauls, tips, tricks and tutorials, as well as swatches and reviews of new/upcoming nail polish collections both mainstream and indie. About Youtuber Hi! This is Minnie and I'm from Japan☆ If you love nail art, WE'RE BEST FRIENDS! About Youtuber A crazy chick that loves nail art and stuff. Hope you find my videos helpful. About Youtuber If you are looking for a super fun friendly corner of YouTube with nail art videos, Makeup inspiration & all things beauty then look no futher, you have found it. Welcome to my channel I really hope you like what you see. About Youtuber I am a Fanatical Nail polish Addict from Australia who Loves painting her nails. Everything I have ever learnt I will Try and teach you! About Youtuber My channel is all about nail tutorials, nail art, and nail designs. Yes...Nail!Nails!Nails!!! From what I've learned throughout my entire career, I will gladly share it with the rest of the world. About Youtuber Hii! I'm Julie Ventura, a nail artist based in LA. I post a range of videos from simple nail art tutorials to tiny complex works of art! About Youtuber Hello! I'm Juli. On this channel you will find everything nail art related! From easy nail art tutorials to reviews of new products on the nail market! About Youtuber Hi! I'm Jessie, a nail art addict from Auckland, New Zealand. I upload a new video every weekend - either a cute new design or a video packed with tips to help you with your nail goals. I'm a qualified nail technician and have lots of information to share that can help your nails to become the perfect little canvases! About Youtuber Hi, my name is Sarah and I'm addicted to nail art! I am half Japanese so my nail art is mostly Japan inspired. I try to upload at least one tutorial a week and I'm planning to do more 3D nail designs in the future. About Youtuber Just a girl living in a nail polish world. A nail art and nail polish swatch channel featuring all polish brands from mainstream to indie polish and the latest nail trends. About Youtuber I am a self taught nail enthusiast that love all things nails. No design is outside the box for me. I enjoy working with acrylics. I do fun and challenging acrylic nails tutorials. I also love the world of beauty. So you'll find occasional hair and makeup videos as well. If you love nails as much as me definitely stick around. About Youtuber Sophie Hardy is a 27 And A Professional Licensed Nail Technician. I Have Been A Qualified Nail Technician For Over 6 Years I Love Creating Nail Designs And Giving Others Advice. I Specialize In Artificial & Natural Nail Care. I Am Obsessed With Anything To Do With Nails. I Use Certain Brands Such As Gelish, Bluesky, Cristina Gel, NSI, Naio Nails, Young Nails, Crystal Nails & Wow Gliters. About Youtuber I'm Sarah! I'm based in the UK & I've been a qualified nail technician for over 13 years - I love anything to do with nail art!! I adore stamping and love working with gel polish as my medium. On my channel you will find my regular Stamping Fun Friday feature, gel polish nail art ideas and product reviews! About Youtuber Hi, my name is April Ryan! On my channel You can watch video tutorials for beginners and nail techs, rewievs for nail products, good tips, and maybe videos from my nail contects! I'm licensed CA nail technician, Top 9 of Next Top Nail Artist 2015 and nail blogger "Red Iguana". My english is not perfect but i LOVE NAILS & EVERYTHING ABOUT THEM, so you will have to listen to my HARD russian accent. About Youtuber 12xUK Nail Champion, Nail tech of the year 2013, scratch nail artist & stylist 2013, over 30 competition titles. Owner of The Nail Team & independant educator. About Youtuber Hi everyone, welcome on my YouTube channel! My name is Miriam, and I'm a nail art addict. I'm from The Netherlands, but I live in the Dutch Caribbean. About Youtuber The Meticulous Manicurist Nail Tutorials sets a new standard in nail education utilizing Real life, Real situations for Real learning. Everything you ever wanted to know about Nails, Manicures, Pedicures, Acrylic Nails, Foot Massage Techniques and Nail Art are shared in her tutorials. She hopes to inspire & enrich the perception of the Nail Career by Nail Technicians. About Youtuber Find videos on nail art by Katy. About Youtuber My name is Swanette. I love nail stamping. On my channel you will see reviews and tutorials. I love helping other learn how to stamp. I hope you find my videos helpful. Subscribe to join the fun! I am not a professional. I just love nail art. About Youtuber One professional Nail Technician's thoughts and opinions on everything nails. I strive to create gel nail looks that my clients can wear to express their individual personality. About Youtuber Sarah Payne is a Nail artist and a youtuber. You may pick from my HUNDREDS of colors, inlays and, gel polish on acrylic, clear tips, baby boomers, french tip, glitter fades, net imprints, stamping foils ect ect OR bring me a photo of someone else work to recreate at the best of my ability. About Youtuber Welcome to my channel! My name is Kristin, also known as @kgrdnr on Instagram. I am a nail artist, and I love to share my unique techniques and passion with others! All of my nail art is hand painted with nail polish only, on my natural nails. About Youtuber A Nail Artist, Educator and Glitter Fairy. About Youtuber Hey welcome to my channel! I'm Kristina owner of Kristina Kouture Nail Studio! I'm in Florida! I try to upload on here about 2 to 3 times a week. About Youtuber Pretty & Cute Acrylic Nail Art & Beauty Products! About Youtuber On Neo Trix you will find best videos related to beauty and fashion category. So you are a single step behind subscribe to this channel to get notified about nail art, nail design, toenail transformation, nails before and after, pedicure and manicure. About Youtuber Kiara Sky Professional Nails is the #1 worldwide salon leader in dip powder, gel polish and nail lacquers. Here you will find the hottest nail tutorials, new products, and exciting collaborations with top nail artists. We will help you step up your nail game and ensure your mani is always looking fierce. About Youtuber BornPrettyStore is a company specialized in nail art, cosmetics, jewelry, clothing & cell phone cases in high quality but lower price. About Youtuber My name is Anastasia Luksha. I am nail artist since 2004. Let's make this world a prettier place together! I am also certified educator for manicure, nail sculpting and nail art. About Youtuber Nail Artist and lover of all things nails... i decided to create this channel as an additional outlet for expression and to be able to share my creations and journey in the industry. About Youtuber Welcome to Nails Bar Studio Channel! Here you will learn how to make beautiful manicure, you will see interesting designs and learn how to use the gel polishes and more. New releases every week. About Youtuber Hello! I focus on my natural nails (no overlays), length, shape and symmetry. If you are trying to grow your nails naturally without enhancements, you're in the right place. About Youtuber I am just a regular woman/girl/mum who love doing my nails. I learn something new everyday here on YT. I am not a professional nailartist unless watching YouTube nailvideos itselves has a degree. I like to do regular nailart with polish, gel, and acrylic. I also love to do glitter mixes and other mixes. And I will also be doing hauls and tutorials. About Youtuber I am a lover of nail art, crafts and DIY's. In this channel you will get to see new nail designs, product reviews and homemade recipes to get beautiful nails. Most of my designs are beginners level and very easy to recreate. I am also a new mom of a beautiful baby boy born on Feb 21st 2015. About Youtuber Hello, I'm Annabel. Over here I bring you nail ideas and things I seem to share an affinity with. About Youtuber Nail Artist based in the UK. About Youtuber Welcome to my channel my passion is nails, I am a licensed nail tech. I created this channel so I can share with y'all different designs using acrylic and gel polish ,I will even do haul videos on were I get my supplies from links to where you can purchase these supplies and any helpful tips or any requests you may have. thank you for subscribing to my channel. About Youtuber Hi I'm Taylor and I absolutely LOVE anything to do with nails, it's how I express myself. I am a Professional Nail Artist. Certified in Acrylic Extensions, Gel Enhancements, Gel Polish Applications, Manicures & Pedicures. You can expect out of this channel NAIL ART TUTORIALS, GEL NAIL Tutorials, ACRYLIC NAIL TUTORIALS, NAIL RELATED REVIEWS & 3D NAIL ART HOW TOs. About Youtuber Nail art of the nerdy, tea drinking variety! Live swatches, reviews and nail tutorials. About Youtuber Welcome to my channel for easy to follow gel nail art tutorials, beauty and lifestyle favorites and honest reviews.I am just a regular UK nail technician, who likes to follow fashion trends and stay ahead of the game, I aim to make my videos QUICK and easy to follow videos. About Youtuber It's tricky to be an engineer when you hate to break a nail. Nail art tutorials, every #TutedayTuesday! About Youtuber Hello my beautiful people! My name is Evie I am a nail technician. I love to show what I learned and what I am still learning. I love nails , and everything things nails related. About Youtuber Hi! Am Mary, dreamy is what describes me and MM are my initials. I'm a MakeUp & Nail Artist for 15 Years. About Youtuber I truly love doing nail art, i have many people that inspire me on YouTube, they are all talented and amazing women that work very hard at what they do. Doing nails is my love and hopefully i can share some of my ideas and experiences with you that i had and will have. About Youtuber My channel is about all things nails. I am a CND Education Ambassador in the U.K and regularly get asked to show how I created designs on nails, this channel is dedicated to tutorials on nail art. About Youtuber This channel is all about nail, nail art, nail design, nail art tutorial, nail polish tutorial, nail art designs, nail art compilation, nail tips & nail trick and how to polish nails. About Youtuber Find videos on nail art by Polished Panther. About Youtuber I'm MaeNailDesigns and welcome to my Nail Art channel. Follow this channel if you like anything nails related, nail art tutorials, DIYs, etc. I'm a licensed nail tech and would like to share my nail art work with you guys. About Youtuber I am an aspiring nail artist who also loves makeup and Kpop. I love sharing my creations and hope that you will enjoy watching them. I also have hauls, product reviews and much more. About Youtuber Hello! I'm Maria, a total nail art addict and founder of SoNailicious.com - one stop destination for fabulous nails. On this channel I'm sharing videos that will teach you how to create fabulous nail art at home. About Youtuber I love nail art, in particular, nail stamping. I share my nail art designs here on YouTube and on Instagram and Pinterest. All the designs I do are on my natural nails. About Youtuber I am Lovely and I share NAILART tutorials, Reviews, DIYs & HAULS here! About Youtuber I want to share my love of nail art with you all and hopefully I can inspire you too. I upload every Tuesday and Friday. Every Friday is a new nail art tutorial and on Tuesday I upload either an extra tutorial, review or live swatch. Some weeks there will be more videos depending on what I have to share with you all. About Youtuber When I began my journey to become a nail tech, there wasn't a lot on information widely available on the internet. I'm here to share my tips and tricks as a nail tech, to other nail techs. I think its important we stick together in this industry, so that our ideas spread, techniques advance and new options become a reality. About Youtuber Hi Everyone! Welcome to my channel! I'm here to help inspire you with nail designs and have a bit of a giggle along the way! About Youtuber Hi! I'm Ginger. I am not a professional, i am just a girl that loves nails! I do simple nail art, stamping, gel, and pretty much anything i can get my hands on. I also do reviews on nail products as well. I love seeing what is next in the nail art community and giving it a try! About Youtuber Welcome to my channel, here you can find nail art tutorials, cute and easy, also some DIYs/crafts/handmade stuff. About Youtuber Find amazing DIY nail art tutorials and designs which can help you learn how to paint your nails. About Youtuber This channel is about Nail art. I will share my Stamping nail creations, swatches and much more and will review all nail art related products stamping plates , polishes and much more so lets learn together. About Youtuber Welcome to my channel! I am a nail technician who loves nail art. My videos will show you how to paint various designs, from simple and easy to much more detailed. I try to upload at least 3 videos a week. About Youtuber Love love nail art and nail polish...and make up 😉 Just a typical girl who likes to share her passion for anything color related 🙂 I am addicted to nail polish, nail art, stamping and anything nail and make up related. If you are interested in a collab or you just wanna chat, leave me a message and I will get back to you. About Youtuber Hello!! This is my nail art channel. I will show product reviews,nail stamping, DIY's and give inspiration on nail art. I am NOT a professional, I work on my natural nails. I also will have friendly collaborations with fellow nail art friends, New and old!!! About Youtuber Hi I am Allie from alliesblog.ca. I am a canadian nail art blogger focusing on nail art, tips tricks and everything else. On this channel i will show you how to create some of the nail designs i do on my blog. About Youtuber My place to share my love of nail polish and nail art. Hope you enjoy. About Youtuber Paint your nails LIKE A BOSS!! I make nail art tutorials! I will show you how to make ALL KINDS of nail art designs. You can find designs inspired by YouTube, Movies, Games, music and what ever you want to see. Nail art for beginners to advanced! I will share my nail tips along the way! About Youtuber I am ALIVIA DAS CHOUDHURY an INDIAN youtuber Based in West Bengal. Through this Channel I am Presented various designs to beautify your nails for various occasions. I do tutorials and Nail art design show that's beginner friendly. About Youtuber Hi, my name is Natalie. I am 34 years old and I am a Stampaholic. I started nail stamping a while back and now I am totally addicted. On this channel you will find product reviews and tutorials of nail stamping (related) products. And of course, you will find nail polishes and other nail art products, too! About Youtuber Hey! I'm Brianna and I love Nail Art. I love to make tutorials on how to do it too. About Youtuber Hi!! I'm Frances and nail stamping is a hobby that has quickly gained a large portion of my heart. I make videos to share and hopefully learn along the way. About Youtuber I am very new to all things Nails and Youtube (Sept 2016). I love every aspect of nail design, techniques and nail art and like to have a go at all. I am not a professional nail tech but practice a lot and hopefully maybe one day I will be. About Youtuber Qualified Australian Nail Technician, Specialising in acrylic enhancements, Relaxing home based salon. About Youtuber Hi and welcome to my channel! Here I will share with you easy nail art tutorials. I am not a professional so I am always learning new designs, and I am so excited to try them and to share them with you! I am from Italy so my english is no perfect, but I try to do my best! I will be very happy if you share your opinions with me. About Youtuber New videos everyday on nail art designs. My intention when doing this video is not to steal nobody's work but share and compile the best ones. 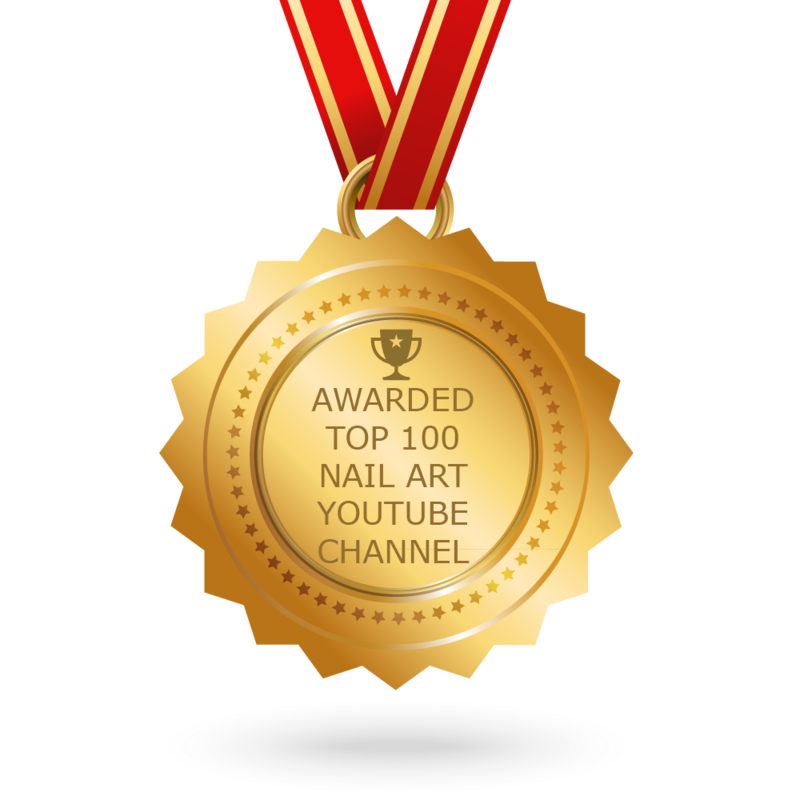 CONGRATULATIONS to every youtuber that has made this Top Nail Art Youtube Channels list! This is the most comprehensive list of best Nail Art Youtube Channels on the internet and I’m honoured to have you as part of this! I personally give you a high-five and want to thank you for your contribution to this world.